The mining ship Red Dwarf continues on its long quest to return home, its dysfunctional crew consisting of the last human being alive, a hologram of his superior officer, a neurotic cleaning droid and a lifeform descended from the ship's cat. In 2018 Red Dwarf will celebrate its thirtieth anniversary, making it comfortably the longest-running SF comedy show of all time (and one of the longest-running SF shows full stop, with only Doctor Who and Star Trek now outliving it). There are several reasons for its longevity: a core cast of four charismatic performers, a strong sense of humour that riffs on both human nature and cutting-edge scientific ideas and multi-year breaks between seasons that allow both the cast and writers to refresh themselves and come back with renewed energy. So whilst the show started thirty years ago, it's only now concluding its twelfth season. The twelfth season is of a pair with last year's eleventh, written and filmed alongside it and recorded at the same time. This raised the spectre that writer Doug Naylor (alas, co-creator and co-writer of the show's golden age Rob Grant remains absent) might be burned out or tired, but this is not the case. Season 12 is, if anything, slightly better than Season 11, with fewer weaker moments and some much funnier moments rooted in both character (always Naylor's weak spot compared to Grant) and SF. The season starts off well with Cured, which asks the question if people can be "cured" of evil and results in a classic Red Dwarf story beat where Lister jams on electric guitar with a "good" clone of Adolf Hitler. Siliconia, where Kryten is "rescued" from slavery by fellow mechanoids, is a bit throwaway but does have some great sight gags and does lean into the SF trope of the "happy slave" who is programmed to enjoy their treatment (something it'd be interested to see Star Wars address at some point). The season's weakest episode is Timewave, set on a ship where criticism has been outlawed, which isn't as funny as it wants to be and has some very lazy gags. Mechocracy, in which the machines on Red Dwarf go on strike and Rimmer and Kryten stage an election to win back their loyalty, is solid if forgettable. The season saves the best for last: M-Corp is a satirical take on Apple which could have felt lazy but actually steps up to being amusing and also makes some nice, intelligent points about (literally) blind brand loyalty and giving corporations ownership of everything. Skipper, the best episode of the season and possibly the last six seasons, taps into the well of Rimmer's self-loathing and disappointment in a way that hasn't been done since Grant was still on board. Although the episode suffers from some continuity issues (the show apparently forgetting that the events of Seasons 7 and 8 happened, and the existence of Ace Rimmer), it is extremely funny and brings back some fan-favourite characters without overusing them to boot. The cast are a well-oiled machine at this point, the guest stars do a good job (although Johnny Vegas's guest appearance feels a bit incongruous) and the show does a lot with what is clearly a limited budget, a "problem" which I suspect has resulted in the show's improved quality since the relatively high-budget days of Seasons 7-9, since it forces a reliance on better dialogue and ideas rather than flashy visual effects. For a TV show about to enter its fourth decade, Red Dwarf (****) is in surprisingly rude health. Superior to the previous two seasons (which were okay, if not outstanding) and certainly far better than the three weak seasons before that, the twelfth season of the show sees it getting back to, if not its best, certainly not far off. The season will be available from 21 November 2017 on Blu-Ray (UK, USA) and DVD (UK, USA). "Last six seasons"? ....woah. 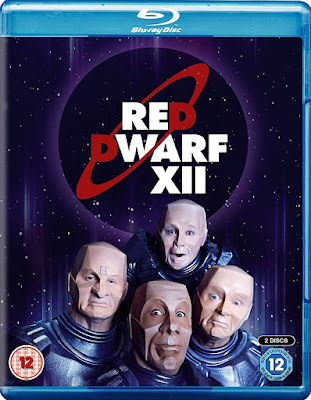 There have now been officially as many Red Dwarf Version 2 seasons (as I think of them) as of real Red Dwarf. That's just... weird. ...but this was the best of the revived series, with four quite decent episodes, and Skipper to me felt like it had really captured at least some of the feel of the original. It actually left me optimistic for the future.